A hundred years ago, the Sandhill Crane population in Michigan hit an all-time low — they were hunted nearly to extinction and suffered greatly from the loss of suitable wetland habitat throughout the state. Due in large part to the passage and protection of the Migratory Bird Treaty Act, the Sandhill Crane population today is strong. Since its inception in 1904, the Michigan Audubon community has consistently supported and fought for protections for Sandhill Cranes. Michigan Audubon’s Bernard W. Baker Sanctuary was established in 1941 as the first North American sanctuary dedicated to the preservation of a crane species, the Sandhill Crane. The sanctuary was founded in part by Dr. Lawrence Walkinshaw, considered to be “The Father of International Studies of Gruiformes (cranes),” at a time when the few Sandhill Cranes nesting on the property represented some of the only pairs in the state. Additional efforts by local chapters, such as Jackson Audubon, who actively manage and maintain Phyllis Haehnle Memorial Sanctuary for breeding and migrating Sandhill Cranes, have also played a significant role in the population’s rebound. 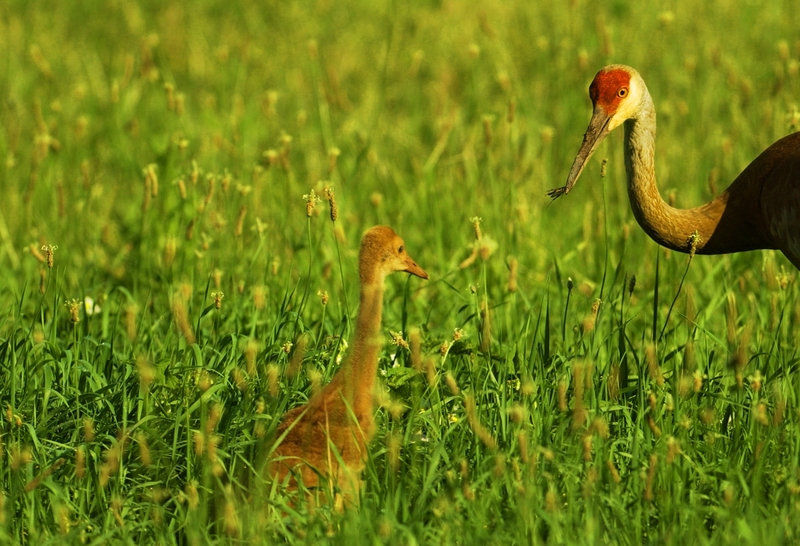 The Sandhill Crane’s history is a conservation success story. This bird’s eastern population has recovered, and they are now abundant throughout the Mississippi Flyway, a bird migration route that generally follows the Mississippi River in the United States and the Mackenzie River in Canada. In response to a measure passed by hunters attending the Michigan United Conservation Clubs convention in early June 2017, Michigan Audubon opposes the proposal of a Sandhill Crane hunt. We believe these birds should continue being protected under the federal Migratory Bird Treaty Act. Cranes and the habitats they use are valued and supported by wildlife enthusiasts, farmers, and other landowners. Cranes evoke a strong sense of appreciation and connection for many people in Michigan and around the world. 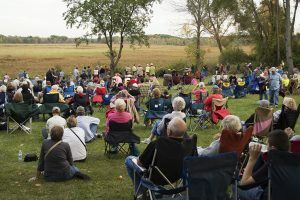 Thousands of people attend annual Sandhill Crane viewing events, including Michigan Audubon’s “CraneFest” and the Cranes, Colors, Cabernet, and Cider Festival. Additional groups gather at migration staging grounds throughout October and November to view nature’s spectacle of migration. While we recognize that Sandhill Cranes inflict crop damage, an open hunting season is not the solution. Opening a fall season to hunt Sandhill Cranes won’t address farmers’ concerns — a localized, site-specific issue — in the spring. Recently-seeded corn fields are an attractive food source for cranes and broadly reducing the population does not change that. Newly developed, non-toxic chemical seed coatings have the potential to redirect Sandhill Cranes to consume insect pests in corn fields and avoid the seed, resulting in a win-win for farmers. Michigan has already established a management tool for agricultural stakeholders. Michigan farmers experiencing issues with Sandhill Cranes can receive crop damage permits from the USFWS, that allow for the legal hunting of problematic individual Sandhill Cranes. These permits allow for appropriately-timed, site-specific action for farmers that will not be addressed by a broad, open season occurring in the fall, when crop damage is not as critical. Michigan’s healthy Sandhill Crane population is likely a source population for neighboring regions where populations are still recovering. 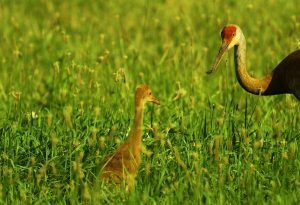 In neighboring states like Ohio, Sandhill Cranes are still considered Endangered, but Ohio’s Sandhill Crane population has grown substantially in the last decade (largely concentrated on the shared state border), which may be attributable to the dispersal of Michigan’s robust population. A crowd gathers to view Sandhill Cranes return to Big Marsh Lake during Michigan Audubon’s Annual CraneFest. 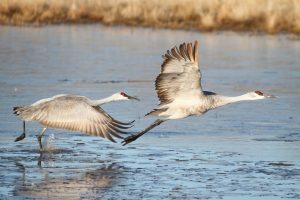 For over 20 years, Michigan Audubon has held an annual celebration of Sandhill Crane migration in October, called CraneFest. The sole purpose of this event is to offer the public a free, family-friendly opportunity to witness these birds fly in at dusk as they pass through southwest Michigan. Appreciating, understanding, and protecting these birds and ensuring their welfare into the future is significant to Michigan Audubon’s history and mission. We are committed to continuing the Sandhill Crane’s success story. 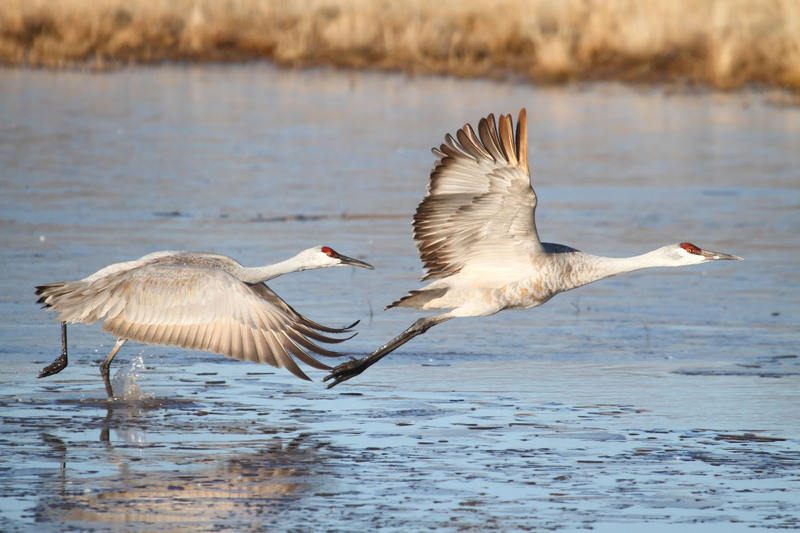 Michigan Audubon encourages residents to make their voices heard in support of bird conservation and help us ensure the Sandhill Crane remains protected in our state.